We are doing our very best to assist you! 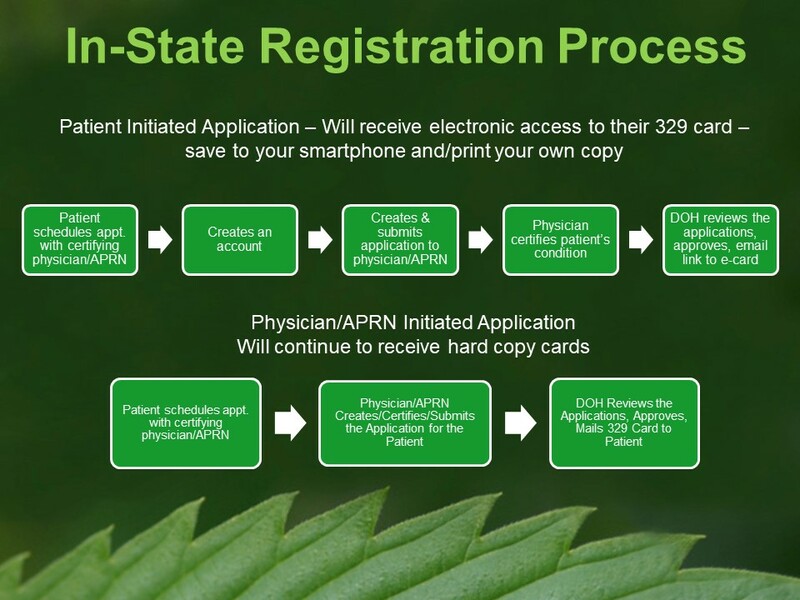 All participants with a medical cannabis registry account will receive renewal notifications via email. Renew 60 days prior to your current registration expiration date. Please take advantage of this opportunity to avoid any lapse in your registration. Direct withdrawal from a savings or checking account. Applications that use direct withdrawals from savings or checking accounts will not be processed until a minimum of 10 business days from date debit (to be sure it clears your account). Applications are reviewed in the order received. Incomplete applications will be electronically returned to you. For patients with online accounts: when your application has been approved, you will receive an email notification to retrieve your 329 card online. For patients that do not have online accounts, you will receive a traditional hardcopy 329 card via U.S. postal mail. Patients are responsible for ensuring that their caregiver receives their 329 card. Your card may be revoked and denied entry into a dispensary if a registration card is tampered, falsified, altered (in any way), modified, or allowing another person to use, tamper, falsify, alter (in any way), or modify a registration card. If you are having technical difficulties you may also contact our IT Help desk at 808-695-4620. They are extremely helpful and doing their best to serve you, kindness is always appreciated.